You can spot a Tremolo harmonica almost immediately by its two rows of holes. 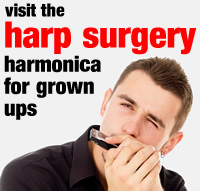 But do beware, other members of the harmonica family, such as the Octave harmonic, also have two holes. It’s the special sound the Tremolo makes, which gives it its name and its unique place in the harmonica family. 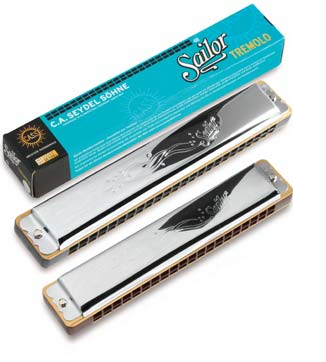 Unlike a regular diatonic harmonica which has one reed for each blow and each draw note, the tremolo has two. The reeds in each pair are identical in size and appearance, however they are tuned very slightly apart fom each other. When the reeds sing, this difference creates a warm wavering quality to the note. The end effect is a jolly sound which is ideal for playing folk music. Here’s Brendan Power of Suzuki Harmonicas to show you how one type of Tremolo Harmonica looks and sounds. Daisy Hughes on Golly Speedy! Copyright © 2019 The Toot Suite. All rights reserved.